As product and service portfolios grow with many companies, it becomes increasingly difficult to correctly price products in quotes and to identify up- and cross selling opportunities. As a result, sales reps require more time to find the correct information, which leads to longer lead time to create a correct quote. Configuring a quote is a time consuming task to do right, and a new breed of solutions now aims at closing this gap. The solutions are called Configure, Price, Quote or CPQ solutions. These solutions aim at increasing the average deal size, accelerate the sales cycle in a workflow leveraged process. As there are many solutions on the market, it is hard to get an overview on the right tool for SAP customers. This blog aims at providing an overview of the available solutions with their highlights. There are currently three CPQ solutions that integrate with SAP Hybris C4C. As a CPQ solution provides most value, when it’s integrated with sales tooling, a following basic landscape is assumed for this comparison. First of all, SAP ECC is in place, completely set up with configured products, pricing and sales order processing. Next to that, SAP Hybris Cloud for Customer is in use for the sales force, to support their selling processes. InMind has several versions of their CPQ solution ranging from a basic version, called Cloud CPQ Express, up to the Insight Selling Suite. The InMind solution is hosted on the SAP HANA Cloud Platform and is easily integrated with both SAP ECC and SAP Hybris C4C (except for the Cirrus Edition, which is meant to be a stand-alone solution). 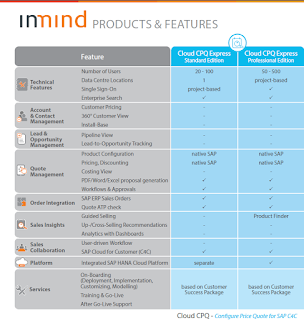 InMind positions the Cloud CPQ Express version as add-on to SAP Hybris Cloud for Customer. The Professional edition is evaluated in this blog. The more extensive InSight Selling Suite can also be integrated with C4C, however, this is only possible if the Cumulus edition is chosen. This suite has more options in supporting your sales rep, like up and cross selling capabilities, yet, the features in the Express edition are quite extensive already. Configuring products and services on a quotation. The configuration options are taken from the Variant Configurations maintained in ECC. This ensures the configuration on the CPQ is always correct. Pricing in taken from ECC directly, so it is always up-to-date and correct. This reduces the risk of pricing errors in the quote. Having a mix of discounts on different lines in a quote makes it difficult to see the profitability of a quote. The discount simulation gives the sales rep immediate insight in the profitability of an offer. Proposals are generated based on a template and can be adjusted by the sales rep where needed. For example, a sales rep can choose to include product details in one quotation, while this is left out in another. The output is versioned and can be exported as Word, Excel or PDF document. Set up thresholds for approvals and approval levels ensure that sales rep get the required approvals, before the offer is communicated with a customer. This gives the organisation the means to be fast in offering a quotation within the sales reps remit and be flexible to offer extra discount in special cases. Check the availability of products in a proposal so a customer isn’t promised something that can’t be delivered within the agreed timelines. In the Cloud CPQ Express a sales rep can add options to a quotation, selecting only valid/relevant products as proposed by the system. These options are not included in the pricing, yet can be included in the quote to show your customer the options they could include in the quotation. The solution is hosted on the SAP HANA Cloud Platform. It integrates with both C4C and SAP ECC easilly. The integration with C4C is on the quotation level through webservices and with ECC products, product configuration (based on Product Knowledgebases), pricing using the Cloud Connector. In C4C, the Cloud CPQ Express shows up as a tab in the opportunity views. More information on InMind Cloud CPQ can be found on their website and on their YouTube channel. More information on the extension of SAP Hybris C4C with InMind Cloud CPQ Express, can be found at the SAP Hybris Extend page. The CPQ solution from FPX is called Smart CPQ. The offered functionality of FPX is very similar to what InMind offers, with a few exceptions. First of all, FPX integrates with many CRM solutions, among which SAP Hybris C4C. FPX has a partnership with SAP, just like InMind, however, their solution is not available in the SAP store. They position their CPQ solution together with e.g. their contract management solution in between C4C and ECC. Configure products and services on a quotation. 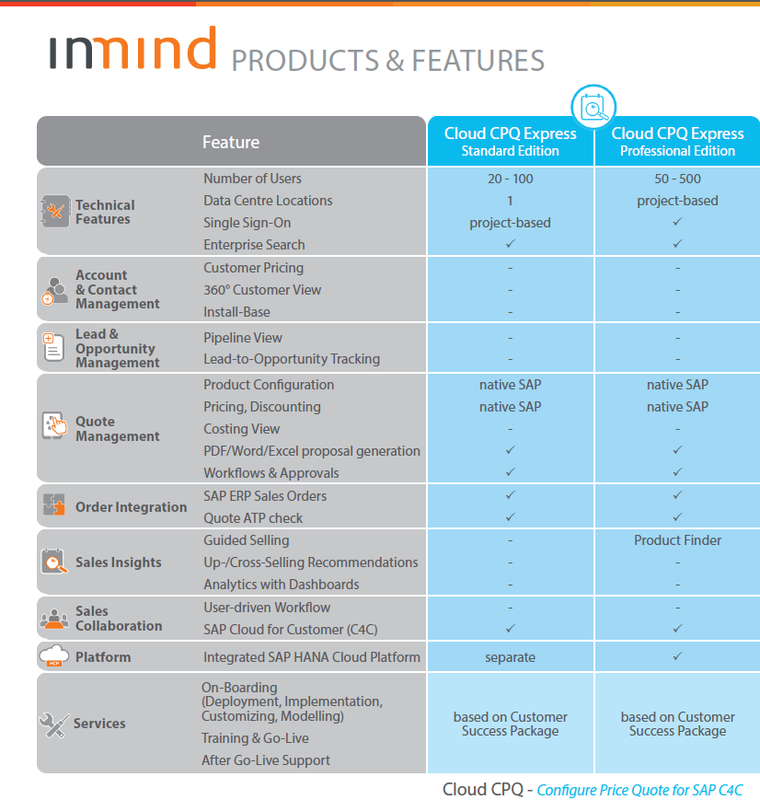 The solution matches the functionality of InMinds Cloud CPQ Express. It also relies on the Variant configuration and the product knowledge bases. The pricing integration works similar to the InMind solution. FPX enables guided selling with their solution. This allows for integration with 3rd parties or allows the customer themselves to select the most suitable product for them. Build up proposals from separate components, including legal terms maintained by the legal department avoids legal issues with quotes. The resulting proposals are therefore always correct. A differentiating factor for FPX is the inclusion of e signature functionality in their solution, allowing for faster deal conversion. Workflows can be set up for approval processes. An ATP check is included in the solution. 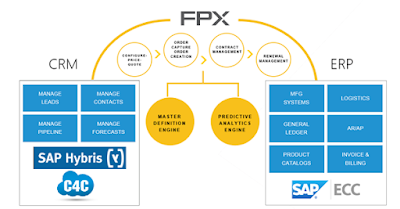 The FPX solution runs on their own cloud, and integrates with SAP Hybris C4C and SAP ECC through web services. More information on FPX Smart CPQ can be found on their website. More information on the extension of SAP Hybris C4C with FPX can be found at their Hybris Extend page. SAP announced SAP Hybris CPQ to become available for Cloud for Customer in 2016. Unfortunately, there is no information on the way it works together with SAP Hybris C4C. As this is the case right now, the solution will be evaluated once more information becomes available. The conclusion at this time is that there are actually only 2 CPQ solutions in the market that integrate with C4C and partner with SAP, each having their own strengths. At first glance both options do offer roughly the same kind for CPQ functionality, however, there are some slight differences. If fast deployment is required, the InMind Cloud CPQ Express is the best option as it’s just one click away in the SAP store. In case more extensive functionality is required, e.g. integration with a web shop to allow customers to create and manage their own quotations, FPX has more to offer. SAP is still working on their solution, which undoubtedly will become a good option for SAP oriented companies. In the mean time, both FPX and InMind will keep expanding their solutions as well. The main recommendation to take away from this blog is to thoroughly think about what you want to accomplish with CPQ and based on that evaluate the available options in the market.